Hope everyone's Ramadan is going well! 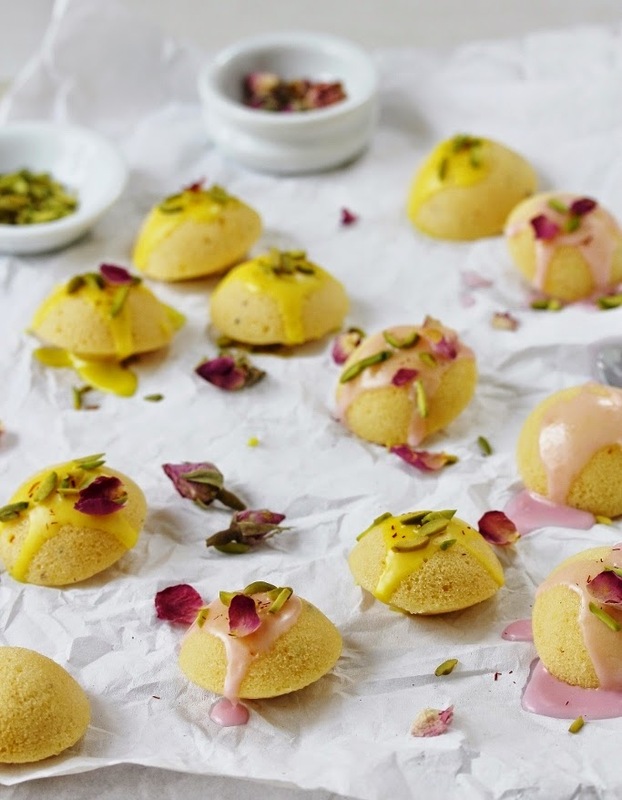 It gets pretty hectic in the kitchen in the hours before iftar time, and with so many little dishes to prepare I often just want a really quick and easy sweet recipe to enjoy with a cup of tea for those later hours! Naturally I scoured my blog for some ideas, and came across my post for Chocolate Glazed Baked Doughnuts. I loved how sweet and perfectly bite-sized these doughnuts were and thought I'd give them a little twist by turning them into something a little more suited to Ramadan. These rose saffron baked donuts are great for fixing that sugar-craving after a day of fasting, and you don't have to eat too many, just one or two if you are trying to stay away from refined sugar. 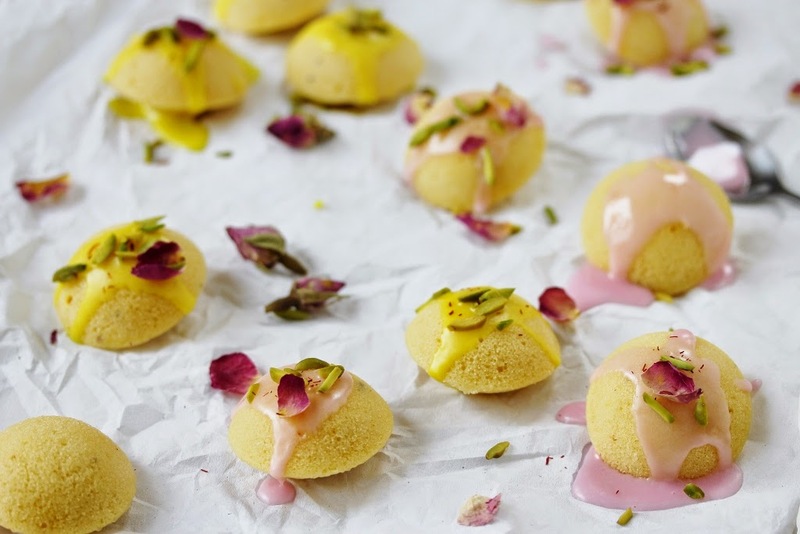 They are like little bite-sized pieces of cake - share them with family and guests over tea and watch them disappear as quickly as they were made! 1. Preheat oven to 180 degrees celsius. Brush doughnut pan with oil, then sieve a little flour all over pan. 2. In a large bowl, sieve together the flour, baking powder, and mix in the sugar and cardamom. 3. In a smaller bowl, whisk together the egg, milk, melted butter and rosewater. Mix in the saffron threads. 4. Pour into the dry ingredients and stir until just combined, without over-mixing. Pour batter into the moulds of doughnut pan, until the moulds are only half full. You do not want to fill them too much as they will rise when baking. 5. Bake for about 15 minutes, until doughnuts are puffed and golden, using a toothpick to test for doneness. Leave to cool 5 minutes before removing from pan and adding sugar glaze. 1. While doughnuts are cooling, make the glaze by mixing together the icing sugar, water and rosewater in a small bowl, until all the icing sugar has dissolved. The glaze should be a glossy white in colour, and not too thick or too runny. If the glaze is too thick, add a few drops of water, or a little more icing sugar if it is too thin. 2. Divide the glaze into two small bowls, and add a drop or two of pink and yellow food colour in each bowl. Mix to achieve pale pink and yellow glazes. 3. 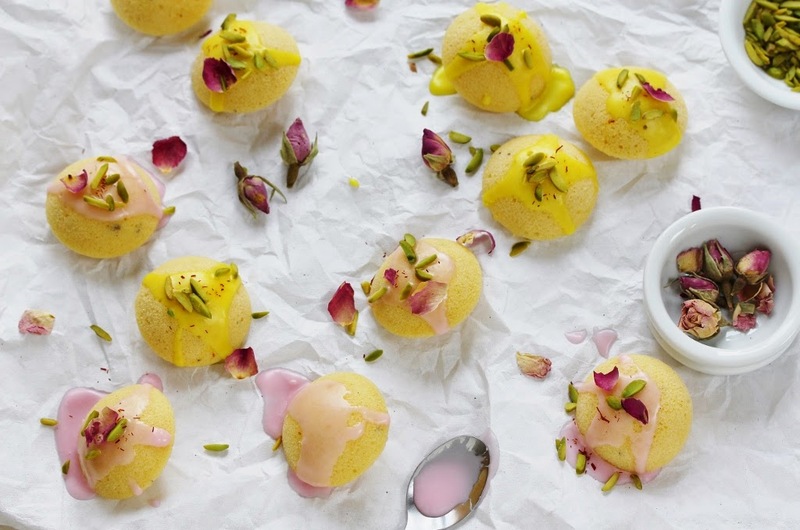 Dip doughnuts individually into the glaze and sprinkle chopped pistachios, rose petals and saffron strands over the top. Glaze will set after a few minutes. Store glazed donuts in an airtight container, and eat within three days.